The Green Wolf isn’t just the name of my business; it’s also an old mythological being from Normandy in France. 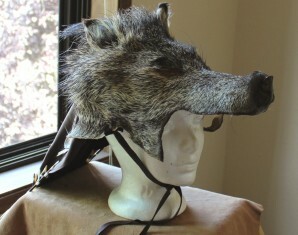 Every year on St John’s Day (just after the summer solstice) one member of a farming community would be chosen as the green wolf; this person would be dressed in leaves and plant material, and then the rest of the people would feign throwing him into a bonfire (of course, they wouldn’t actually do it!) This was a way to symbolize overcoming the challenges of each year’s farming–danger to the crops, outlaws hiding in the fields, and the like. In this way the green wolf took away the threats to the community, and was celebrated afterward for his sacrifice. While a wolfskin wasn’t historically used in this celebration, I wanted to draw on the aesthetics of the tradition some for this creation. 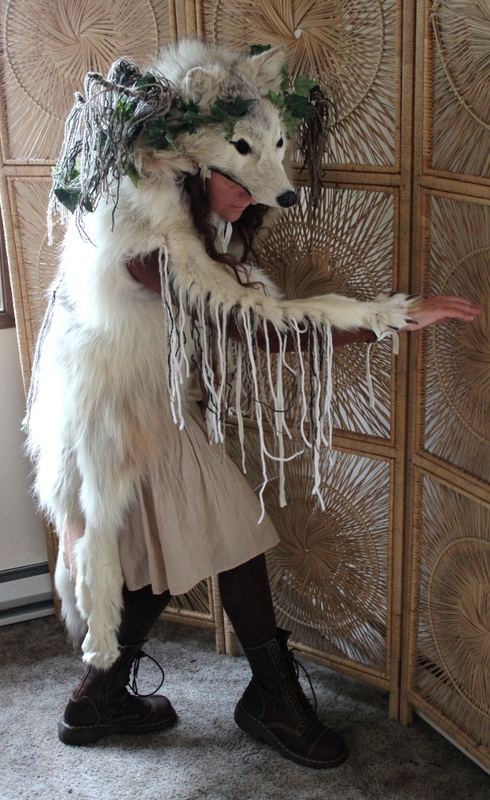 I started with a large white Arctic wolf hide–70″ long from tip tp tip–with all paws and claws, and after doing a bit of repair work, I reshaped the face and ears. I added straps of white deerskin that tie on under the chin, straps to tie the forelegs to the wearer’s arms, and another set that tie criss-cross over the chest to carry most of the weight. But that was just the beginning! 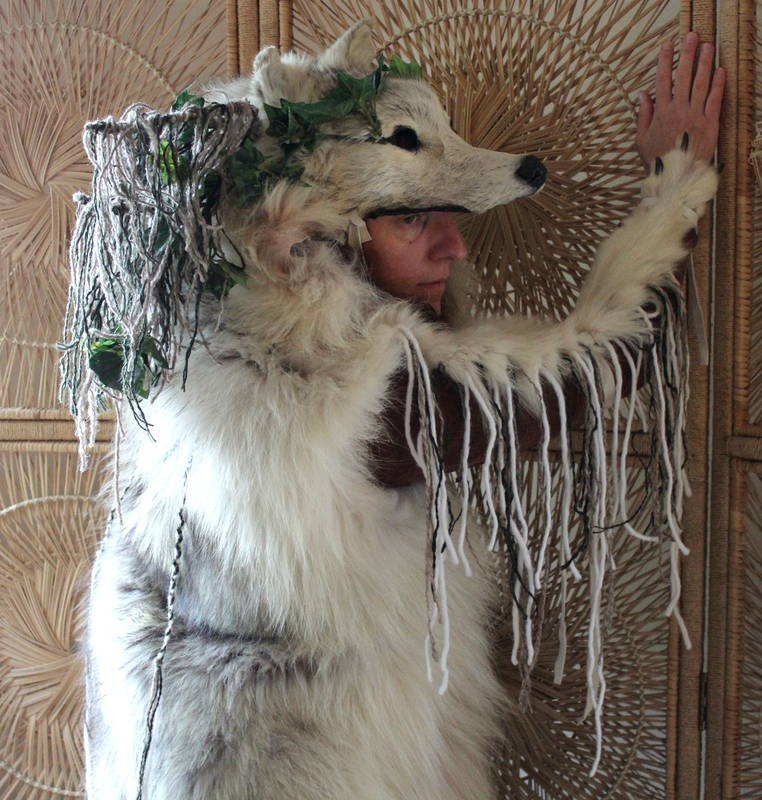 On the back, I decorated the hide with a long braid made from secondhand white, green, and gray-brown wool yarn, some of it homespun, and a handmade green and black wolf ceramic pendant, flanked with two metal bells that ring when you move. The head is decorated with faux ivy that I details with paint by hand. There are also two “horns”; I made these by taking some faux branches and wrapping them multiple times with more of the same yarn, and then adding many tassels hanging down like moss. These horns are adjustable, as the branches have wire inside; they took a few hours to create just on their own. And the forelegs have more yarn tassels hanging down. 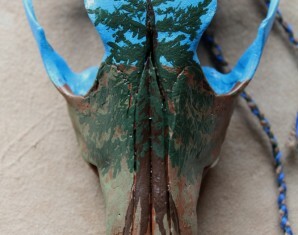 This headdress has become something of a symbol of my business, and is in my personal collection. Shown at the Curious Gallery 2014 Art Show.